Something about this ALWAYS brings the quilt police! Thread: Something about this ALWAYS brings the quilt police! Whenever I lay out a quilt, they all come running. What's up with this? Just finished my Diamond quilt using Kaffe Fasset fabrics. Trying to decide what to use for backing. This is for our CA King. Yes, it's big! I love sewing diamonds! Any time I put something on the floor my dog thought it was for him. Those aren't quilt police, those are inspectors. BIG difference!! Quilt police are the ones who tell you there is only one right way to do something. They are the ones that say crazy things like machine quilting isn't real quilting, points should always line up, you should never use a sheet for backing, etc. etc. etc. Inspectors don't say anything, they just check things out. Is that a Bernese Mountain Dog puppy in the 2nd pic?? No, Australian Sheppard. She "hurds" all the shitzu's (3). She watches everything they do. Cuts them off if they run too fast past her. Thanks for the clarification. They are definitely inspecting! wow, that is one big, gorgeous, conglomeration of fabric. Thank you for your kind comments Nancy. ....because they are movie stars and they thinks it's the red carpet treatment? Great quilt top! Wonderful use of Kaffee! Love your quilt top. My fuzzy one always wants first rights of napping on any finished quilt top or finished quilt. I have to wait till I put him out to layout a quilt , or ...yup its like a calling to have to lay smack in the middle. That is so pretty. Love the colors and the merging of them. My last set of inspectors liked to "help" with the sandwiching - sitting on the batting. One of the current set likes to rip out any visible batting. That doesn't help when the quilt still needs borders. Love the colors! I have a herd of shi tzus also. (3) They are by my feet as I type, quilt, eat, sleep. Yep they are always there! Your quilt is really pretty!! 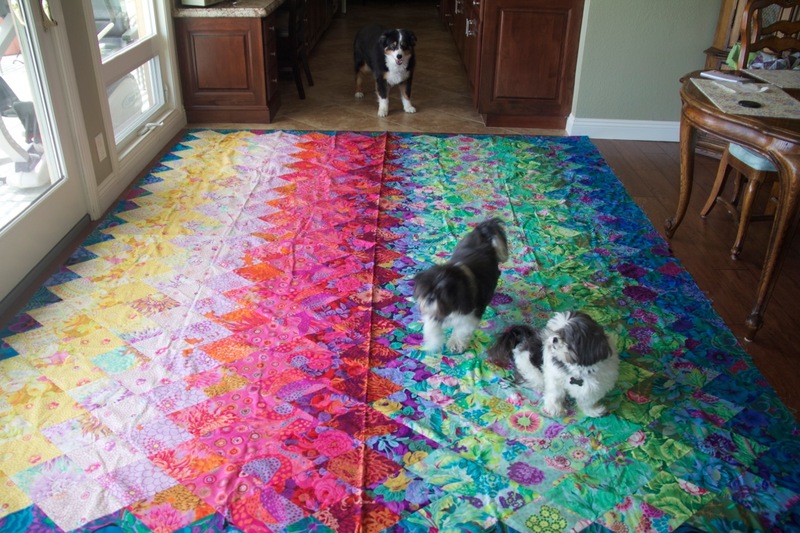 Love your quilt and your inspectors! That is utterly gorgeous. You did Kaffe Fassett proud! Love the quilt. Beautiful work. As I'm reading I have a yorkie and a very pregnant rat terrier on my left side and a Siamese cat on my legs, they have to "help" do everything! Gorgeous quilt! The Aussie's not bad, either, lol! They're great dogs! 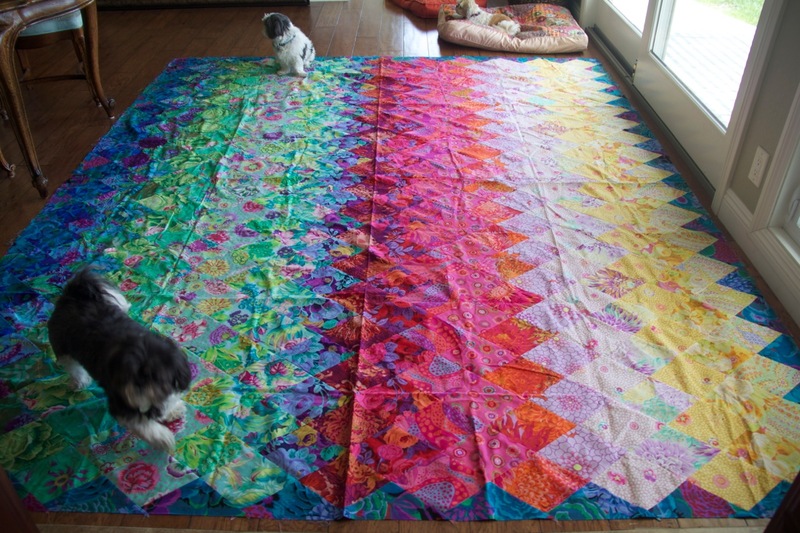 Love the quilt and the dogs! You must have been thinking that you needed help. they read your mind. Besides, they are family and family is there to help. great quilt!!!! It's not so bad if they get on it when it is sewn together! Mine loves to do it before that and rearrange block for me - not sure if that is an inspector or police! That is beautiful and I LOVE your quilt police!! !